The exhibition Syntax at the Photographic Resource Center in Boston includes Light Work artists Matthew Swarts (LW AIR 2004), Patti Ambrogi (LW AIR 1979, 1991), and Meggan Gould (LW AIR 2009). The exhibition, which is scheduled to open March 27, examines the meaning and aesthetics of work by artists who have made the new possibilities of digital information a central theme in their work. The exhibition is described at length in the newest issue of PRC’s journal “In the Loupe” (vol. 33, no. 2). 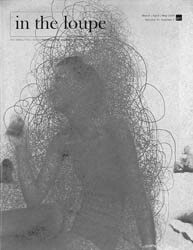 An image by Matthew Swarts is featured on the cover. Swarts and Ambrogi participated in Light Work’s Artist-in-Residence program in previous years. Meggan Gould is scheduled to come to Syracuse in May 2009.